The first novel in five years from the ever-popular Kingsolver (Pigs in Heaven, 1993, etc.) is a large-scale saga of an American family’s enlightening and disillusioning African adventure. It begins with a stunningly written backward look: Orleanna Price’s embittered memory of the uncompromising zeal that impelled her husband, Baptist missionary Nathan Price, to take her and their four daughters to the (then) Belgian Congo in 1959, and remain there despite dangerous evidence of the country’s instability under Patrice Lumumba’s ill-starred independence movement, Belgian and American interference and condescension, and Joseph Mobutu’s murderous military dictatorship. The bulk of the story, which is set in the superbly realized native village of Kilanga, is narrated in turn by the four Price girls: Leah, the “smart” twin, whose worshipful respect for her father will undergo a rigorous trial by fire; her —retarded” counterpart Adah, disabled and mute (though in the depths of her mind articulate and playfully intelligent); eldest sister Rachel, a self-important whiner given to hilarious malapropisms (“feminine tuition”; “I prefer to remain anomalous”); and youngest sister Ruth May, whose childish fantasies of union with the surrounding, smothering landscape are cruelly fulfilled. 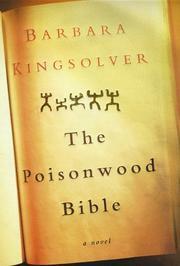 Kingsolver skillfully orchestrates her characters— varied responses to Africa into a consistently absorbing narrative that reaches climax after climax—and that, even after you’re sure it must be nearing its end, continues for a wrenching hundred pages or more, spelling out in unforgettable dramatic and lyric terms the fates of the surviving Prices. Little recent fiction has so successfully fused the personal with the political. Better even than Robert Stone in his otherwise brilliant Damascus Gate, Kingsolver convinces us that her characters are, first and foremost, breathing, fallible human beings and only secondarily conduits for her book’s vigorously expressed and argued social and political ideas. A triumph.